Biography*: Text from "Lest we forget" Chicago's Awful Theater Horror. Death*: She died on 30 December 1903 at Iroquois Theatre, Chicago, Cook County, Illinois, USA; Text from "Lest we forget" Chicago's Awful Theater Horror. [S628] Chicago Tribune, August 10, 1941, Chicago Tribune Historical Archive, Record No. 19410810dn063. [S630] 1900 US Census, Illinois, Cook County, Chicago, Washington, DC, ED 1025; Page 3A; Ward 32, Ancestry.com; accessed March 6, 2006. [S661] Bernice Vallely, Illinois Statewide Death Index, Accessed, March 7, 2006. Death*: He died on 13 August 1945 at Chicago, Cook County, Illinois, USA. Vallely - Frank (Francis G.) Vallely, Aug. 13, 1945, beloved brother of Lillian and Joseph Vallely, Mary Louise Reaum, Henry Vallely, and Eileen Leahy, and the late Dr. Linton Vallely. Resting at funeral home 4506 Sheridan road. Funeral Thursday to St. Ita's church, 5500 Broadway. Complete notice later. [S1314] Chicago Tribuen, March 1, 1927, page 20, ProQuest Historical Newspapers, accessed February 11, 2011. 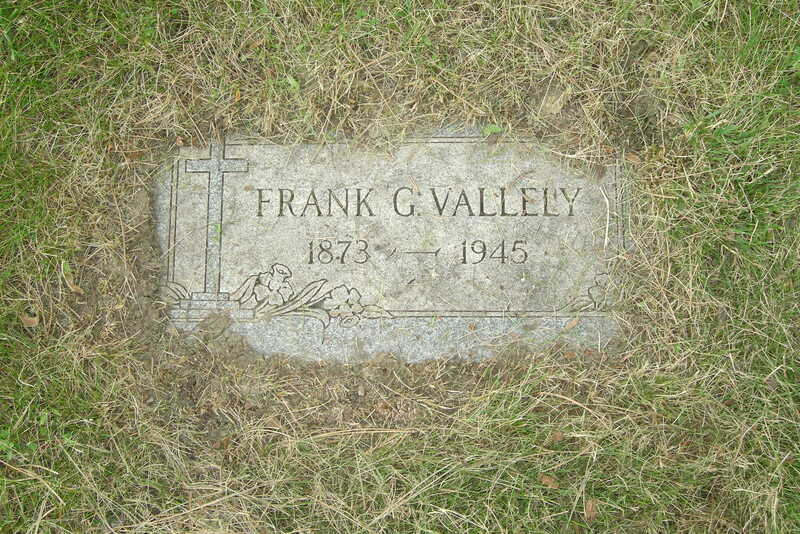 [S2173] Frank G. Vallely Cemetery marker, Queen of Heaven Cemetery, Hillside, Cook County, Illinois, USA. [S1315] Chicago Tribune, August 14, 1945, page 10, ProQuest Historical Newspapers, accessed February 11, 2011. [S1251] Illinois, Deaths and Stillbirths Index, 1916-1947, online FamilySearch.org, John Linton Vallely, death date 7 August 1941, FHL Film# 1953675. Accessed Ancestry.com June 30, 2015. Dr. John Linton, Vallely of 837 W. Lakeside place, Aug. 7, fond father of William and the late Bernice, brother of Francis, Joseph, Henry, Lillian, Mrs. T. M. Leahy, and Mrs. William H. Reaum. Resting at chapel 5228 Sheridan. Funeral Monday, at 9:30 a.m. from chapel, to St. Thomas of Canterbury church. Burial Mount Olivet. [S631] Chicago Voter Registration, 1890, page 464. [S627] Illinois Statewide Marriage Index 1763-1900, online www.cyberdriveillinois.com/GenealogyMWeb/marrsrch.html, Vallely, John L. and Beder, Edyth E., Marriage License No. 00180544. [S1305] Chicago Tribune, August 9, 1941, p. 8, Proquest Obituaries, accessed February 9, 2011. [S2174] Joseph Vallely Grave marker, Queen of Heaven Cemetery, Hillside, Cook County, Illinois, USA. Death*: She died on 28 October 1948 at Chicago, Cook County, Illinois, USA. Vallely - Lillian Vallely, Oct. 28, 1948, late of 919 Lakeside place, beloved daughter of the late Clara and Francis Vallely, dear sister of Joseph, Henry, Eileen Leahy, Daisy Reaun and the late Dr. Linton and Francis G. Vallely. Funeral Saturday, 9:30 a.m., from funeral home, 4506 Sheridan road, to St. Thomas of Canterbury church. Interment Mount Carmel. Information LOngbeach 1-4714. 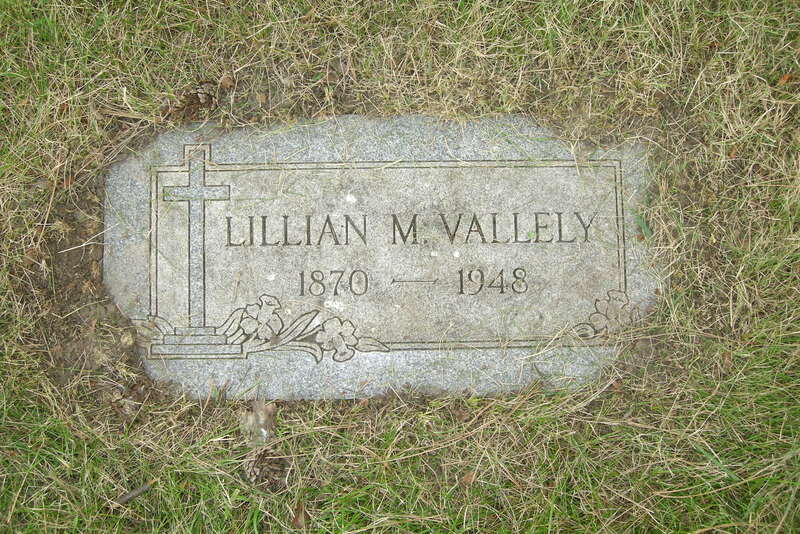 [S2172] Lillian Vallely grave marker, Queen of Heaven Cemetery, Hillside, Cook County, Illinois, USA. [S2172] Lillian Vallely grave marker, Queen of Heaven Cemetery, Hillside, Cook County, Illinois, USA, Record in cemetery office lists Lillian as Margaret Lillian. [S1321] Chicago Tribune, October 30, 1948, page 10, ProQuest Historical Newspapers, accessed February 11, 2011. [S632] 1930 US Census, Illinois, Cook County, Chicago, Washington, DC, ED 721; Page 5B, Ancestry.com; accessed March 7, 2006. [S1963] Daniel Moore, "Question for You," e-mail to Elaine Beaudoin, November 17, 2014, Source: Family History LIbrary, FHL Film Number 1308604. [S1963] Daniel Moore, "Question for You," e-mail to Elaine Beaudoin, November 17, 2014, Source: SSDI. [S1317] World War II draft registration card for William E. Vallely , Microfilm series: M2097, Draft Board, Chicago, Illinois. [S1319] William Edward Vallely, Illinois Birth Certificate no. 46972, FamilySearch.org, accessed February 9, 2011 (January 6, 1919). [S1320] William Edward Vallely, Illinois Death Certificate, FamilySearch.org, accessed February 9, 2011. Death*: He died on 20 January 1955 at Chicago, Cook, Illinois, USA, at age 67. William Vallely, 67, of 7715 Lowe av., who died January 20, five days after he was found unconscious in the street at 81st and Halsted sts., died of undetermined causes, a coroner's jury found yesterday. [S1316] World War II draft registration card for William E. Vallely , Draft Board, Chicago, Illinois. [S1318] Vallely-Cunningham Marriage License, no. 658942: FamilySearch.org, accessed February 9, 2011. [S853] Bernice Vallely, Illinois Certificate of Death, Micropublications #6000585, Family History Library, Salt Lake City, Utah. [S1335] Chicago Daily Tribune, February 2, 1955, page 18, Proquest Historical Newspapers, accessed February, 2011. [S86] William E. Vallely, January 25, 1955, Certificate # 6002439, Bureau of Vital Statistics, Cook County Clerk's Office.